BARACK OBAMA will face a sobering array of problems when he takes office as the nation's 44th president next week, but the color of the reporters who will be covering him is not one of them. Nor is the pigmentation of Washington journalists one of the unnerving problems with which the news industry should be grappling these days. With so many other things to worry about, and with the whole world able to see that racial identity is no longer a barrier to even the most powerful position in American life, you might think the press would finally be ready to abandon its unhealthy preoccupation with the color of skin -- especially the skin within its own ranks. Alas, no. "Obama, Like His Predecessors, Will Face a Press Corps Lacking in Minorities," laments the Washington Post on the front page of Monday's Style section. Media reporter Howard Kurtz describes "the relative paucity of black journalists at the White House" as a "cause for concern," and he isn't the only one who thinks so. Even President Bush is quoted as saying that "there need to be more minorities in the press corps." But why should it matter to anyone but a racist whether a White House reporter is black or white? Well, says Michael Fletcher, a colleague of Kurtz's, "you would want to have black journalists there to bring a different racial sensibility." By the same token, more evangelical journalists would presumably bring a different religious sensibility to the White House, more journalists from the Deep South would bring a different regional sensibility, and more Republican journalists would bring a different political sensibility. But do you know of any news organizations that are fretting over the "relative paucity" of evangelicals, Southerners, or Republicans on their payrolls? Me neither. Meanwhile, Politico reports that Obama's accession to the White House "is prompting major changes in the nation's black press, ushering in a series of firsts that editors say will reshape print, internet, radio, and television coverage aimed at African-American audiences." 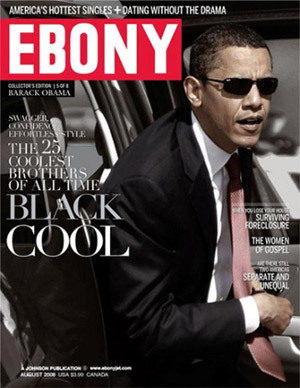 Among those changes: Essence and Ebony, two top magazines among black readers, are going to assign reporters to the White House. Jet magazine is adding a two-page Washington report to each issue. On Jan. 20, Black Entertainment Television will replace its "booty-shaking music videos" with a live, four-hour broadcast of Obama's swearing-in. TV One, another black-oriented cable network, is going even further, with 21 hours of inaugural coverage. All of which, Politico observes, marks something of a return "to a time when the black press -- particularly magazines -- were newsier." It was Jet, for example, that first printed the shocking pictures of lynching victim Emmet Till in 1955. But hold on. If it's been decades since the black press paid close attention to presidential politics, why should anyone be surprised that black reporters haven't been thronging the White House press room? If bringing that "different racial sensibility" to Washington journalism hasn't been a priority for Essence or Jet, why should it have been one for the Washington Post or NBC? The plain if unfashionable truth is that the White House press corps, like journalism generally, doesn't need more black reporters. It doesn't need more white reporters, either. Journalism needs good reporters, and good reporting isn't a function of race. If the color of Obama's skin is immaterial to his fitness to occupy the White House, surely the color of any other man's skin is immaterial to his fitness to cover the White House. Washington journalism will not be improved by seeking out "journalists of color," but by seeking out journalists of integrity, talent, and thoughtfulness. Americans are often astonished to learn about the Japanese obsession with blood type. To us it is the sheerest nonsense to believe that blood type determines character, personality, or matrimonial suitability, but millions of Japanese are convinced of it. Four books on the importance of blood type were among Japan's bestsellers in 2008, selling more than 5 million copies. We wonder that intelligent people can put stock in such nonsense; we can't imagine that anyone would let an irrelevant physical characteristic like being AB-positive or O-negative affect a hiring decision or a romantic choice. Shouldn't we find equally preposterous the irrational belief that skin color is related to professional skill, intellectual outlook, or journalistic "sensibility?" It is time to lay aside such superstitions, even as we have laid aside the shibboleth that a black man cannot be president of the United States.